After a woman pastor, who had preached in college chapel, spoke in my Women in the Bible class, two women students challenged her right to preach by asking, "But how can you be a pastor and lead men in light of 1Timothy 2:9-15?" The pastor responded, "You know, God called me to preach and I started preaching before anyone ever called my attention to 1 Timothy 2:11-12. Since God called me, and the validity of my calling had been affirmed by the church and by conversions, I just continued to obey God and follow the call to preach while I learned how to properly interpret 1 Timothy 2:11-12." The eight authors of Women in the Church would deny that God called her, or any other woman, to preach because they "are convinced that 1 Timothy 2:9-15 prohibits women from teaching or exercising authority over men in the church" (9). Also, they contend that the movement towards equal rights for women in church and home is a "dubious strategy" (193) symptomatic of a civilization "which has increasingly strayed from God's order of creation" (199). The eight male authors must have failed or forgotten their introductory church history courses when they claim there has been "virtually universal agreement on the role of women in the church "and that this supposed agreement "constitutes presumptive evidence against the progressive view" (209) of women as pastors. On the contrary, women pastors, and women teaching men, have existed at least since Priscilla and Maximilla of the Montanists, the Waldensians, Margaret Fell of the Quakers, and the women in the Wesleyan/Holiness and Pentecostal churches, many of which have always ordained women. Ironically, while the eight men blame the modern feminist movement for the increased number of women pastors, in Wesleyan/Holiness churches the number of women pastors has declined since World War II, partly because of the patriarchal backlash represented by diatribes like this one. The eight authors say they argue from an "order of creation" approach. They claim that God created Adam first and that "Paul appeals to the created order, the good and perfect world God has made, to justify the ban on women teaching" (134). Two flaws mar this argument. First, in Genesis 1:26-28 God gave joint dominion to man and woman at the same time. There is no hierarchy or order of creation according to Genesis 1:26-28, as pointed out by women expositors such as Alma White, the first woman bishop of a denomination in the United States. Subordination of women emerged as a result of the Fall. Thus, Women in the Church actually argues from the fallen order rather than the created order. In addition, in Women in the Church, the historical re-reading of the New Testament world is misleading. The authors contend that women in the Greco-Roman world, and especially in Ephesus, were not devalued. However, their chapter "A Foreign World: Ephesus in the First Century" negates that contention by concluding to the contrary: "Ephesian religious affairs were governed by...authorities who were decidedly male" (24). In antiquity, Cicero warned "men to rule their wives" and outlined how to build a society in which men prevailed over women (De repub. 4:5-6). Ramsay MacMullan, a historian of the Roman world and one who does not have an axe to grind in favor of women, has documented how "the sense of hierarchy ruled behavior"3 in the Roman world. Furthermore, the eight authors also fail to address the role of Gnostic women at Ephesus who were the targets 1 Timothy 2:11-12 addressed. A principle of hermeneutics (the theory and process of interpretation) is that clear texts should illumine obscure texts. Thus, 1 Timothy 2:9-15's cloudy perspective on women should be interpreted in light of the overwhelming witness of the New Testament regarding women in ministry, especially Acts 2:16-21, Galatians 3:28, the women cited as Paul's co-workers in Romans 16, the women who were the first witnesses to the resurrection, and Phoebe whom Paul recognized as a deacon in Romans 16:1. One wonders how the eight contributors would explain the presence of the woman Junia whom Paul calls an apostle in Romans 16:7, since apostles were preachers? There are only two texts in the New Testament which can possibly be used to attempt to prohibit women from being pastors, 1 Corinthians 14:34-35 being the other, but these men build their theology of ministry on these two isolated texts while ignoring the clearer witness of the broader New Testament. Two severe inconsistencies exist in this book. On the one hand, the authors explain away the need to wear braided hair and the prohibition against wearing jewelry in 1 Timothy 2:9 as cultural injunctions that are not binding today. Why not say the same regarding 1 Timothy 2:12-13? Second, they admit that Deborah was a leader with authority over men but contend that this exception should not become the common practice. How can they make that decision, especially since God used women such as Mary Magdalene, Phoebe, Junia and Priscilla to teach or preach to men? Many churches, such as the Wesleyan/Holiness, Quaker and parts of the Pentecostal traditions have taken these biblical leaders as their models for women in ministry. This so called exception became the rule in the Spirit-led church. 153). Their statements regarding women's rationality are stereotypical, sexist and probably reveal these men's own insecurities. If one were to substitute the words "African American" for "women" in many of their statements (such as on pp. 144, 145, 146, 151 and 153) they would rightfully be accused of racism. They also err in claiming that women who enter seminary to prepare for pastoral ministry are "mistaken" (105). It takes a lot of gall to suggest that women preparing for, and in, pastoral ministry have not properly heard the Holy Spirit call them! Who do these men think they are to decide to whom the Spirit speaks? Admittedly, it is legitimate for the eight men to debate the views of Richard and Catherine Kroeger in I Suffer Not a Woman, but at times their tone is mean, as evidenced by their repeated tendency to label everyone who disagrees with their view as having a lower view of biblical authority than they do—even though by so doing they also are attacking other solid evangelical scholars such as Gordon Fee, David Scholer, and Aída Besançon Spencer, scholars teaching at leading evangelical schools and who would not have been hired if they did not have a high view of Scripture. Women in the Church is a desperate effort by eight men to preserve the pulpit as a last bastion of male supremacy. It is a narrow and anachronistic book because it ignores the scholarship of most significant women scholars who value biblical authority. Its authors need to dialogue not only with Catherine Kroeger, but also with scholars such as Judith Gundry-Volf, Aída Besançon Spencer, and Cheryl Sanders (who is a pastor as well as a professor). While objective scholars will easily discern this book's errors and biases, other readers may be misled by the pseudo­scholarship in this piece of patriarchal propaganda. Therein lies its danger. 1. Benjamin T. Roberts, Ordaining Women (Rochester, NY: Earnest Christian Publishing House, 1891), p. 58. 2. Women, Authority and the Bible, edited by Alvera Mickelsen (Downers Grove, IL: InterVarsity Press, 1986). 3. Ramsay MacMullen, Roman Social Relations (New Haven: Yale University Press, 1974), p. 112. 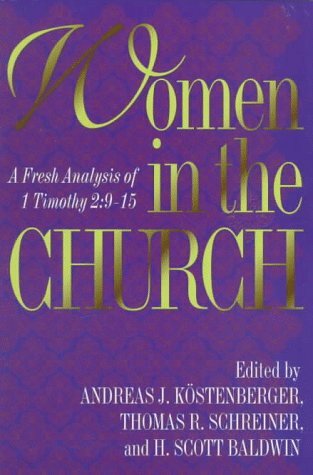 John E. Stanley is a CBE supporter and writer who contributed a review of the book, Women in the Church: A Fresh Analysis of 1 Timothy 2:9-15.